I forgot to tell you yesterday: I have bronchitis. I called in yesterday and went to the doctor. I'm on antibiotics, prednisone, and Phenergan-&-Codeine cough syrup. This morning I started coughing up green stuff, so I missed work again today. It's been years since I did this. It's a nuisance. I'm glad I didn't do this during horse sale week. I wonder if working all six days of horse sale week was a contributing factor. The alarm went off at 5:45 this morning. I got up to see how I felt, coughed up the aforesaid green stuff, and called in. 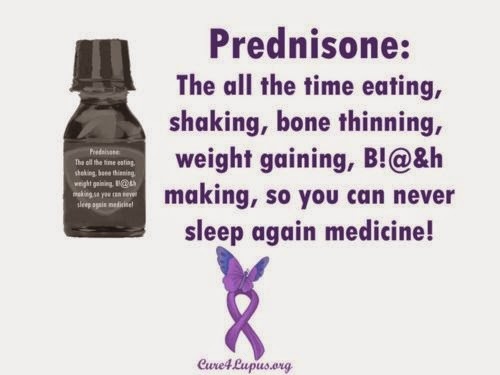 Being on prednisone - and having my four animals - there was no possibility of going back to sleep. I said morning prayers, checked out cyberspace, and got up. I wasn't been able to take naps today because of the prednisone, so I knitted and watched an NCIS marathon. Today I learned what the critters do while I'm at work. They romp around the house. There was lots of noise and commotion, a good bit of wrestling and chasing (all in fun), and a good time was had by all. Jethro dragged all of them around by the neck while they lay there and purred. Hunter was seen to slap Jethro on the rear with his paw to get it started. They had toys out, too, but they mostly played with each other. I opened the windows when the temperature reached 55, and everybody piled up in the window sills and enjoyed it. They seemed to like having me home - even shy Abby spent some time in my lap. Tonight I've been listening to Pandora for the first time in several weeks. It still hurts sometimes - I cried a little during Wedding Song - but not as bad as it did before. I am healing. I can hear good memories in most of the music now instead of being eviscerated. Leather and Lace made me feel wistful instead of suicidal. That's progress. Sometimes this progress makes me feel guilty, but I know that's silly. I'm being normal. I'm doing a pretty good job of feeling what I feel, of observing rather than judging it. We WFFs are learning together - if several of us are doing it, we declare it to be normal. So there. How's that for the scientific method? I'm going to bed early again tonight. If I feel good enough in the morning I'll text Danielle and see if they need me for part of the day (it's my normal day off). Don't worry - if I'm feeling bad I'll stay home. I need to get over this. I'm working my long day at the drive-up on Friday, my 11-hour day, and I'm back in on Saturday. I won't take chances. You and Mama would gang up on me if I did that. I'm doing a much better job of keeping food in the house just in case, so I'm not starving. We're all fine here.